Bomb-proof in Fort Stedman. Library of Congress. Fort Stedman, according to historian Bruce Catton, was “a square box of a place, with solid walls enclosing a space for the guns. 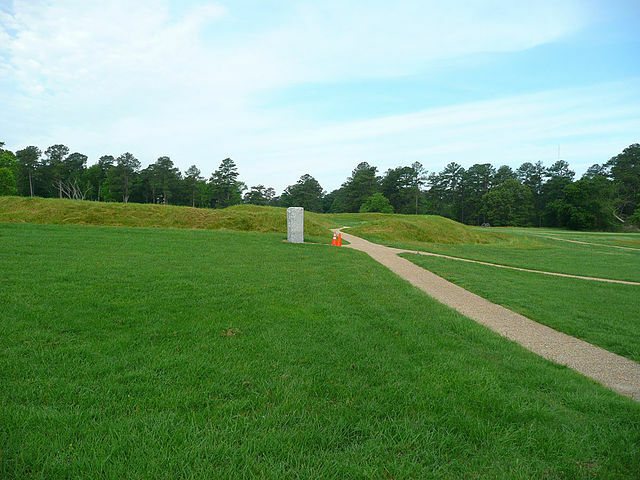 Inside the enclosure were sodded mounds over the dugouts in which the soldiers slept and kept their stores.” In addition to the guns in Fort Stedman, three ravelins had been constructed close by along the entrenchments known as Batteries X, XI and XII. Stedman and its flanking batteries were one of many such clusters of gun emplacements along the roughly 30 miles of siege lines running around Petersburg. The fort’s distinguishing characteristic, however, was that it stood at the narrowest distance between the two opposing siege lines. 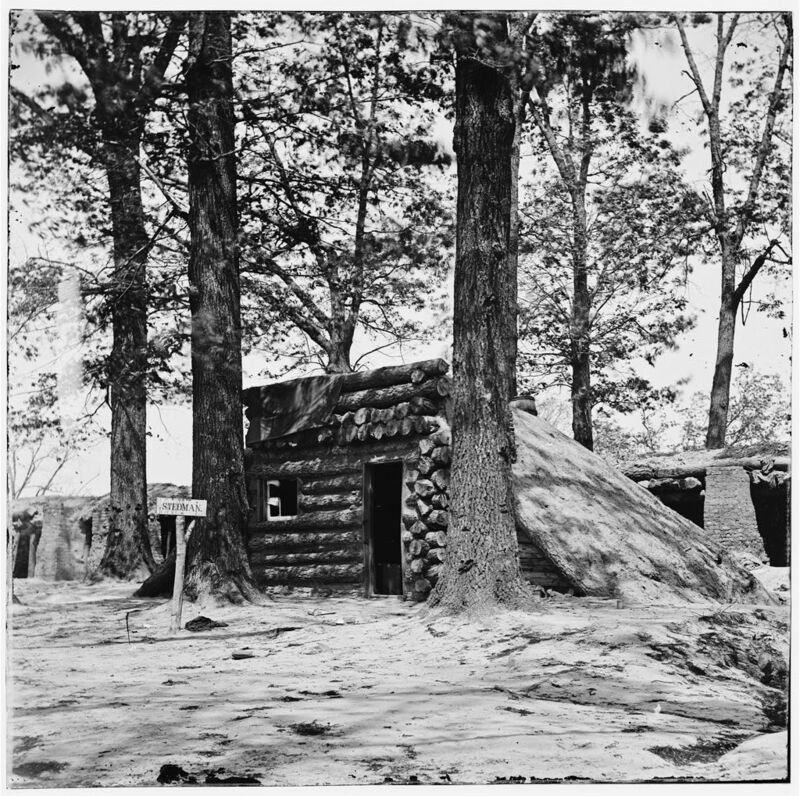 A mere 200 yards of “no man’s land” separated the Union troops in Fort Stedman from the Confederates in Colquitt’s Salient. The assault on Fort Stedman was designed by General Gordon with utmost stealth in mind. He selected 50 stalwart men to go out in advance of the attacking column in the dark of night with axes to cut through the chains, abatis, and chevaux de frise placed in advance of the Union lines. The same group would quietly force an entry through the rear sally port of Fort Stedman. Again, using axes. No shots fired. Three columns, each of 100 men, familiar with the names of all the Union officers on that part of the line would follow up. Feigning to be Union troops, and their officers assuming the roles of specific Union officers, they would push their way to the rear, spreading false commands in an attempt to confuse the enemy. Once the lines had been breached, Gen. Gordon would command a force of roughly 12,000 men to exploit the gap. And General Lee was prepared to commit another 6,500 from General George Pickett’s Corps if the movement were successful. The assault, in theory, might result in the collapse of the entire left of the Union siege lines. At 4 a.m., the assault began. Initially, all went as planned. The 50 men with axes cleared the way. The rear sally port of Fort Stedman was taken by complete surprise and the fort captured in a very short time with minimal shots fired. The guns of Fort Stedman were turned to fire along the flanks at the Union batteries on either side and to the rear. General Gordon was soon enough in the fort himself and dispatched the three companies of 100 to the rear of Union lines. The Union lines had been breached and additional forces were on their way. Meanwhile, in Battery XI, roughly 200 yards to the south of Fort Stedman, Major Charles T. Richardson, commanding the 29th Massachusetts Infantry, had a sense that something was wrong. He heard a smattering of shots fired from the direction of Fort Stedman and ordered his regiment to fall in. The regiment had fought in many of the toughest battles of the war in several states. Their numbers had been reduced to about 200 men. Shortly after they were assembled, a sentinel on the parapet of Battery XI called out that there was no attack. Still, Richardson did not dismiss regiment. He climbed to the top of the works and peered through the gray light of dawn towards Fort Stedman. Among the ranks of the 29th Massachusetts was First Sergeant Calvin Francis Harlow. Tall, slim, dark-haired and blue-eyed, he was 22 years old. He was from East Bridgewater, Massachusetts where he had worked as a nail maker. He enlisted on May 18, 1861. As Major Richardson tried to determine what was happening, it soon became apparent to Harlow and the rest of the 29th Massachusetts that an assault was underway. About 500 Confederates had gained the rear of Battery XI. They stormed the ravelin and fierce hand-to-hand combat ensued. According to Walt Whitman, who apparently heard Harlow’s story from his comrades and wrote about it in his book Specimen Days, Harlow was among the many in the regiment who were quickly surrounded by Confederates. Numerous men of the regiment surrendered. Sgt. Frank Harlow, ordered to lay down his weapon, answered, “Not while I live,” and called for his comrades to fight. He attempted to do so, but soon found himself confronted by the pistol of a Confederate officer. The officer insisted that Harlow yield. Harlow aimed his rifle. The Confederate officer fired and at the same time, Harlow managed to get off a shot. The two men fell dead, one of top of the other. According to the regimental history, the incident happened a bit differently. Historian William Osborne recounted that Harlow shot the Confederate officer and then was shot in the head by one of the Confederate soldiers surrounding him. Either way, Sgt. Harlow died because he could not bring himself to surrender. The site of Fort Stedman today. Courtesy of Wikimedia Commons. Surprised and overwhelmed, the 29th Massachusetts fell back toward Fort Haskell, the nearest defensible position southward along the entrenchments. Major Richardson wasn’t the only commander who suspected something was very wrong in Fort Stedman. Other regiments had formed up and soon Union General John Hartranft was organizing a massive counterattack, coordinating infantry and artillery along the entire line in the vicinity of Fort Stedman. Numerous regiments charged in to close the gap, including the green 200th Pennsylvania which suffered grievous casualties. When the men of the 29th Massachusetts searched through the dead and wounded in Battery XI, they found the body of Sgt. Frank Harlow lying atop the Confederate officer he had shot. They buried him and he was eventually re-interred in Poplar Grove National Cemetery near Petersburg. He was in the Seven Days fight before Richmond, in second Bull Run, Antietam, first Fredericksburg, Vicksburg, Jackson, Wilderness, and the campaigns following—was as good a soldier as ever wore the blue, and every old officer in the regiment will bear that testimony. Though so young, and in a common rank, he had a spirit as resolute and brave as any hero in the books, ancient or modern—It was too great to say the words “I surrender”—and so he died.